Peeling potatoes is tedious enough without having to do battle with ill-designed kitchen gadgets. Why hadn’t these objects evolved to accommodate users, rather than the other way around? Sam Farber found himself wondering just that when he noticed his wife Betsey, who suffered from arthritis in her hands, struggling to use an old-fashioned peeler. Farber had recently retired as CEO of Copco, a cookware company he’d founded in 1960, and he and Betsey, an architect, had decided to head to Provence to spend some quality time pursuing their passion for the arts, both visual and culinary. As he observed Betsey’s frustration in their Provençal kitchen, it struck Farber that cooking implement design was stagnant: designers might find new manufacturers or rebrand their wares, but nobody was working towards changing the fundamental forms or materials of cooking tools. These objects had remained basically the same throughout the twentieth century, and nobody was working towards making them more practical, more appealing, or more useful, particularly for older users whose physical limitations require more thoughtfully designed products. Thus, in 1989, OXO International was born. Farber set out to create a line of transgenerational kitchen utensils designed to accommodate users of all levels of age and ability. Working with the New York-based design firm Smart Design, Farber and his team spoke with consumers, chefs, and members of a New York arthritis group to learn how they could redesign the way people work in the kitchen. They also evaluated existing implements to see how and where they failed their users; rusted metal, cracked plastic, and uncomfortable grips created problems for aging or disabled users and caused great inconvenience to people across the spectrum. The result was the Good Grips line. The series was comprised of newly conceived peelers, scissors, and knives that incorporated large, oval-shaped handles, non-slip, temperature-resistant plastic rubber Santroprene grips, and ergonomic shapes that let the tool do the work, rather than the user. 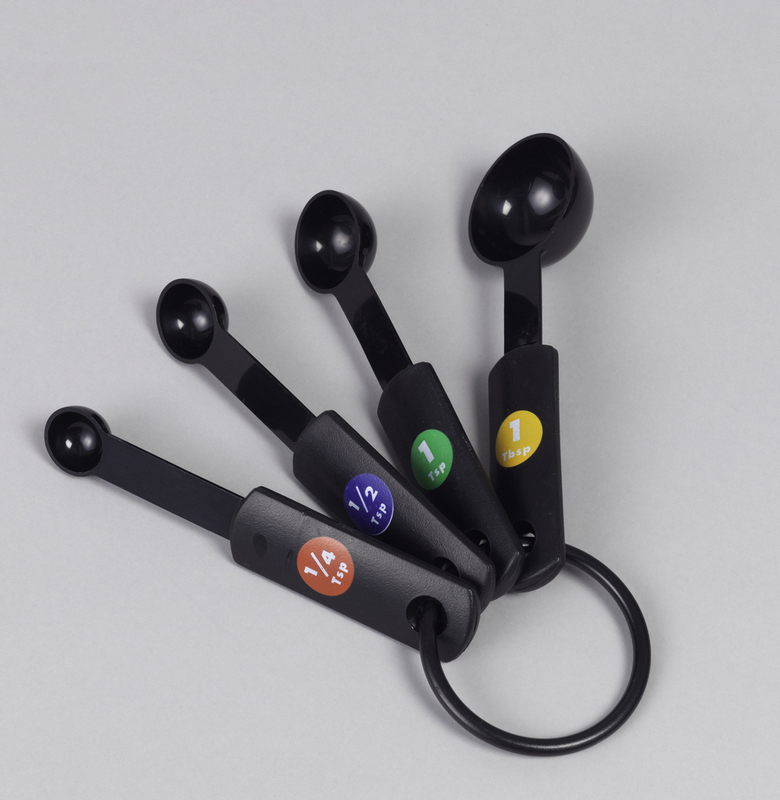 A supplementary line of measuring cups and spoons, the latter pictured here, were designed with larger handles for easier gripping, bigger type for better legibility, and a color-coding system to make selection faster. Additionally, the measuring spoons are made of molded acrylonitrile butadiene styrene (more commonly known as ABS plastic), providing a non-stick surface from which both wet and dry ingredients easily slide, leading to more precise measurements and less clean-up time. Good Grips eventually expanded to include garden tools, grill accessories, kettles and containers. Farber and Smart Design even worked to produce new types of product packaging that would reduce waste and space in the landfill. The OXO approach to rethinking kitchen gadgetry was a holistic one, beginning with market research and rigorous prototyping, progressing through the exploration of materials and manufacturing processes, and ending with a finished product whose packaging, branding and marketing were conceived not as an afterthought, but as parts of the whole. In involving the design team at every stage of production, Farber was able to create not just a new fleet of highly usable and thoughtfully designed kitchen tools, but a new approach to identifying and resolving design problems that puts the user first. I&28;17#ve observed this … I’ve observed this new nutritious diet regime known as DietOramy (look on google)ï»¿ – my sister said she started working with it and already reduced number of kilos, without feeling hungry or drained at all… what do you think, has anyone used it but? Was this answer helpful? Good Grips Measuring Spoon Set, ca. 1990; Abs plastic; Gift of OXO, 1992-52-28-a/e.